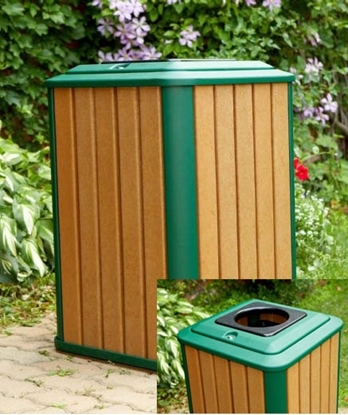 Choose from a variety of commercial outdoor trash receptacles and waste containers constructed with high quality recycled plastic. Recycled plastic garbage cans are a site amenity that is environmentally friendly for parks and schools. Recycled plastic trash cans are more expensive at the time of purchase compared to a wooden or plastic trash can, but will last a lifetime and doesn't need to be replaced. Recycled plastic lumber does not need to be painted, finished, or repaired for the life time of the product. Our commercial recycled plastic trash cans will keep your property litter free for many years with no maintenance.